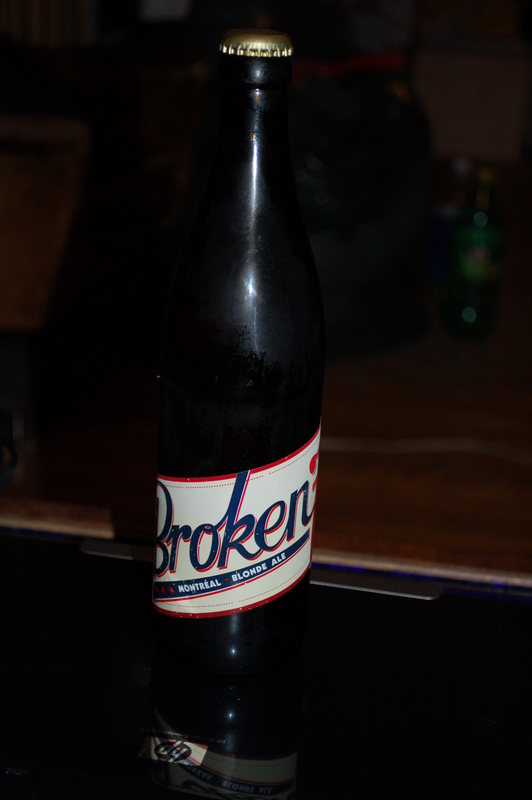 Over the weekend I tried a new beer, Broken 7 by La Compagnie de Bière Brisset (so new in fact, that in this day and age, I can’t find a single useful link anywhere for either of them). I ended up recording my thoughts about it. Call it the Zekecast, Zeke’s Montreal Beer Podcast, a beercast or whatever. You can download it here: Ogg Vorbis 14MB, MP3 27MB, Flac 98MB, WAVE 227MB. In a nutshell, it’s a very reasonable and nice beer made better by it being made locally. Bright yellow, 5% abv, it comes in thin 500ml brown bottles with a label that evokes baseball uniforms. It has strong hay overtones with a nice aftertaste, I also was able to taste and smell at first some celery then a vague citrus scent and flavor (somewhere in between lemon and grapefruit) and a slight hint of something approaching licorice. However the lasting image and memory is of a late summer pasture. It’s much better when drunk extremely cold. For those who are interested, the players on the Expos who wore the number 7 were Bobby Wine (1969 – 1972), Bob Stinson (1973 – 1974), Tony Bernazard (1979), Ron LeFlore (1980), Hubie Brooks (1985 – 1989), Lou Frazier (1993 – 95), F.P. Santangelo (1996 – 1998), Orlando Merced (1999), Todd Zeile (2003) and Tony Batista (2004). But as I point out Alain McKenna is probably wrong in thinking that there is any link to baseball, as here in Montreal the name will be pronounced “broh-kuhn set.” As the number seven is pronounced “set” in French. So it is much more likely that if there is any sports connection it is to tennis. And it only occurred to me now, that not only did he not write anything substantial about the beer, but what little he did write, he got wrong, implying that it is a Lager, when in fact it is an Ale. For those following along these links will prove helpful. The Montreal Expos 1973 season (also here, here and here). Schaefer Beer, Rheingold Beer and the two paragraphs in La Presse that Alain McKenna, wrote about the beer. The address for Epicerie Unique is 4109 St. Laurent, here in Montreal.